Coogee Beach - Sunday Mania! 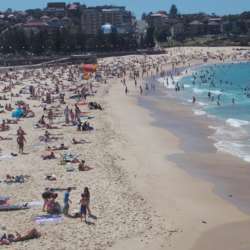 You must be a member of the Sydney Beach Lovers Group to attend this activity. Would you like to join this group? Let's GO on a Sunday full day out at Coogee Beach. This event is BYO and/or grab a bites/drinks at cafe nearby. There is a Woolies and Maloney's grocery stores nearby. beach blanket, togs, towels, sandals, food/drink, sunscreen, sunnies, frisbee, snorkelling/swimming gear, guitar -- for those who are musically skilled, your opal card and A big smile! Option Protected content the train to Bondi Junction and follow the bus signs to Coogee Beach. (Bus # Protected content Bus # Protected content . E-Z peezy. Street parking is first come first serve. 1. Itinerary is not absolute and may vary depends on the actual situations; weather, pacing, etc. 2. Hosts has the right to cancel the event if the weather is not favorable. 3. Host has the right to adjust the itinerary on or before the event. 4. Host are not liable for any lost or damages of your valuables.